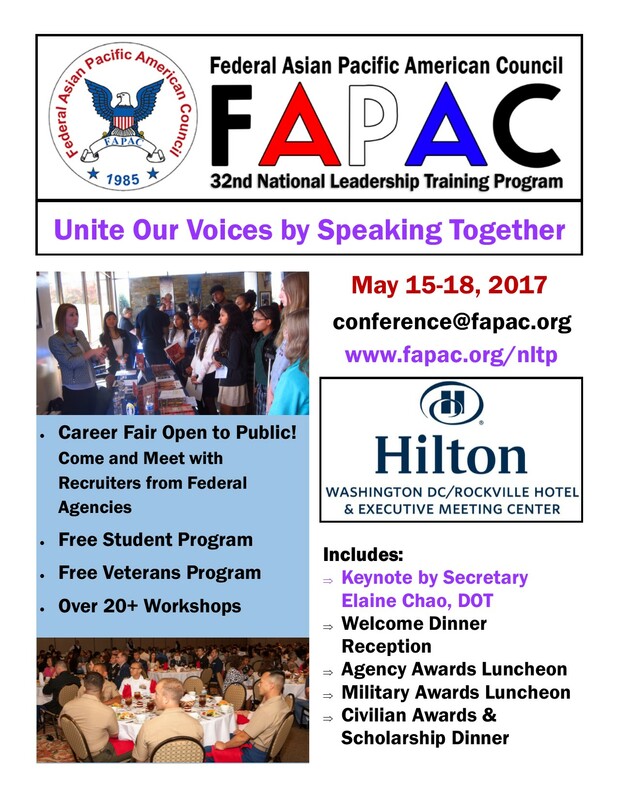 Training Objective: The FAPAC annual National Leadership Training Program is a premier training destination for federal employees including DC government and military. It is designed to provide training in leadership, diversity & inclusion/EEO, and career advancement and management. Who should attend: Open to all federal employees. Agenda: View the 2017 Agenda here! Q. What is the theme? The theme this year provides a single focus for all AAPI’s to unite by speaking together. This theme encourages the various AAPI communities to join together to overcome misconceptions and stereotypes about the vibrant and diverse AAPI community. The AAPI experience varies greatly and all groups must join together to communicate our individual experiences. Diversity is a Journey and we can not travel there alone. By uniting our voices, we can raise issues and tell stories that elevate the AAPI community. With this theme, we hope to improve representation in the workplace by communicating the benefits of a diverse workforce. Register online by clicking on the Register Here Button above! Please enter the information as it will appear on your name badge. A confirmation of your registration will be sent to your email address for your record. Students and Veterans do not need to register and can attend the Student and Veteran Workshops for free. Students and Veterans can also visit the agency exhibits and meet recruiters and agency representatives from various federal agencies including NASA, USDA, EPA, FAA and the military services (Army, Navy, US Coast Guard, etc). Q. When does Registration end? The regular cost for regular attendees is $895. The cost for exhibitors is $1250. The cost includes two lunches and two dinners. Students and Veterans can attend the Wednesday Student and Veterans program for free. Meals and training workshops are not included for Students and Veterans. The Program Agenda is available here and will continue to be updated as we finalize details. Q. What is the Executive Mentoring Workshop? Executive Mentoring or Coaching is an opportunity for Federal employees to meet with a seasoned, senior Federal manager to receive personalized career advice. Coaching provides an opportunity for more direct, give-and-take interaction than plenary sessions or larger workshops. The format of the coaching session will be one on one or in small group. Please remember that the questions must be limited to professional advice. Q. How can I make hotel reservations? Please reserve your hotel room here. Free in room internet is included with each room. Make your reservation by the deadline to obtain the government rate for federal attendees. Government per diem rate is available until April 25, 2017 or when the FAPAC room block is filled. Read the cancellation policy with the hotel reservation. If you have problems please contact conference@fapac.org. Q. How do I suggest a speaker? We currently not looking for any speakers since we received a lot of speaker suggestions and only have a limited number of speaking opportunities. Thanks to everyone who suggested speakers! Q. Do you have a flyer? The flyer is available here (PDF) .